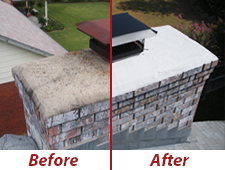 Because of its unique “Quick Drying” water base technology and its easy brush on application, CROWNCOAT BRUSHABLE SEALANT has become a favorite among chimney professionals. Like CrownSeal, CrownCoat is premixed and can be used wherever a long lasting waterproof membrane is needed. Fill larger cracks and voids with patching cement or high quality caulk, then apply two coats of CrownCoat. 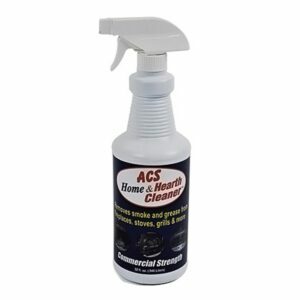 Because of its unique quick drying water base technology and its easy brush on application, Crown-Coat Brushable Sealant has become a favorite among chimney professionals. 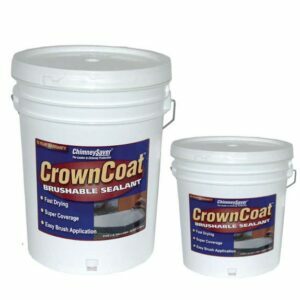 Like Crown-Seal, Crown-Coat is premixed and can be used wherever a long lasting waterproof membrane is needed. Fill larger cracks and voids with patching cement or high quality caulk, then apply two coats of Crown-Coat. When applying to a “new” crown allow the crown 48 hrs. cure time before applying the crown saver. This will cover approximately 40 sq. ft. per gal. The surface and air temperature should be above 45 degrees Fahrenheit for proper application. Make sure to not apply if the temperature is expected to dip below 45 degrees Fahrenheit for a period of 4 hours after sealer is applied. Do not apply on wet or saturated surfaces. Make sure that it does not rain for 4 hours after it is applied unless it’s protected by a polyethylene film. 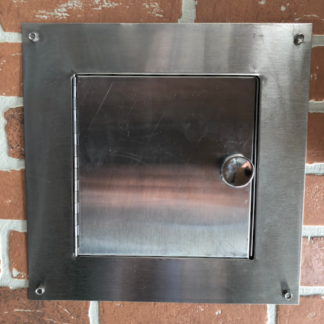 Store unused product in an air tight container above 32 degrees Fahrenheit. 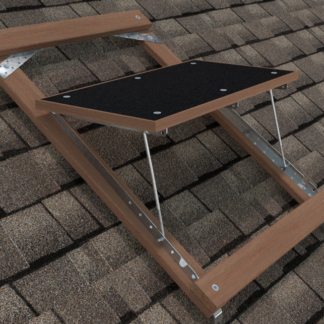 The surface to be coated must be structurally sound, not loose, and the surface must be clean and dry. Brush the surface with a wire or poly brush to remove any loose material. If the surface has larger cracks, you can fill them with 100% silicone caulk. Before applying Crown Coat, lightly mist the top of the crown with clean water. Make sure not to flood the crown. 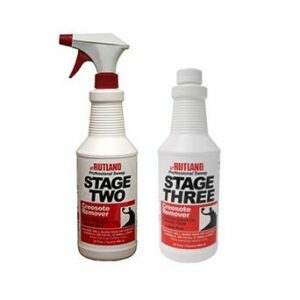 Misting will help Crown Coat penetrate the crown creating a strong bond. Use a 3 to 4 inch synthetic bristle paint brush. Brush a thin coat over the entire crown, working Crown Coat into the crown like painting a wall. Once you have applied the first coat you will have to wait a few minutes before applying a second coat, so that the first coat will form a tacky film. To finish, brush a second heavier coat. For a clean finish, wrap duck tape around the brick sides of the chimney and the flue. Crown Coat can be stored for 18 month shelf life.